SAA Signature Member Andrew Denman recently posted this essay on his Facebook public page and included it in his latest newsletter. With his kind permission, it is reproduced here. Wildlife art is in serious need of a therapist, or at least a conscientious and impartial friend who's willing to lend a sympathetic ear. Over a decade into the new millennium, wildlife art seems to be in the midst of an identity crisis. I see the evidence sprinkled throughout museum and gallery shows, hear it whispered at workshops and art receptions, and encounter the debate in social media forums. Certainly among my closest colleagues the question comes up with some regularity: just what is the future of wildlife art? The online publication, Wildlife Art Journal has been one of the more lively participants in this discussion. Two recent articles are a case in point, sculptor Simon Gudgeon's "A Meditation on Wildlife Art" and painter Ron Kingswood's provocatively titled essay "Is Animal Painting Dead?" Both authors make the case that 21st Century artists must abandon pure representation and go beyond the thing observed if animal art is to remain artistically relevant. It's certainly a clarion call that I, as a more contemporarily leaning animal painter, respond to with favor. Gudgeon astutely points out that wildlife is a subject, not a style, and that "wildlife art" has straddled many different genres throughout history. But if wildlife art is not a cohesive genre, why have so many animal artists subsumed into the weary stylistic homogeneity that dominates the field today? Other subject matter driven art forms, figurative work for instance, don't seem to make this error. While there will always be popular trends, there seems to be no broad social or market pressure for every figure painter to approach figures in the same way; instead there's plenty of room for this more interpretive approach, that more objective one, this one more painterly, that one more photorealistic. Amongst friends of mine who paint figures, I've never encountered with the same frequency or forcefulness the desire to "correctly" represent their subject matter that I've experienced among wildlife artists (and even felt myself). Certainly wildlife has always been approached in a diversity of styles, but the natural history and scientific illustrative roots of animal art, coupled with the commercial dictates of the print market, and even today's popular emphasis on ecological narrative, have all lead to a certain orthodoxy in wildlife art, one that overwhelmingly values the objective over the subjective, the commercially acceptable over the personally fulfilling, and the "technical skill" of the artist over his intellectual and spiritual vision. Every animal artist, whether he agrees with it or not, knows that the overarching expectation of the market is this: a detailed animal painted in a detailed environment engaged in a natural behavior. In such a climate, it's easy to see how paintings like mine and many of my closest contemporaries that use the natural world not as a template for pure mimicry, but rather as a springboard for less objective explorations, stand out as oddballs. Is it any wonder then that so many animal painters who don't play by the rules of wildlife art are reluctant to call themselves wildlife artists at all? Though in my childhood my primary focus was fantasy art, I've painted wildlife all of my life, and when animals began to assert themselves as my primary subject of choice at around age fifteen, I was thrilled to discover that wildlife art seemed to be one of the few artistic communities that appreciated representationalism for what it was rather than scorning it for what it wasn't. 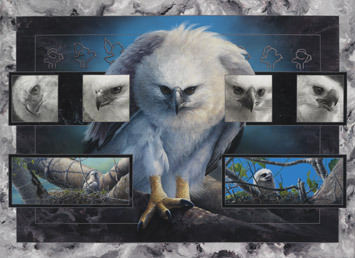 I had the unique experience of being inducted into the professional wildlife art world at a very young age, exhibiting with Pacific Wildlife Galleries in Lafayette, CA, since age 16, an association that granted me the opportunity to meet Bob Bateman, John Seerey-Lester, Terry Isaac, and Carl Brenders, among others. Every artistic evolution begins with observation and description, and at the time, these artists provided me with great motivation to hone my skills. The more I struggled to draw and paint what was in front of me, the more I became aware of how the "mainstream art world" dismissed my chosen field. I regarded the snobbery of the academic art elite with my own resentment, carrying an attitude not unlike that of a misfit child who asks, heedless of the irony, "Why don't those popular jerks like me?" It wasn't until my own experimentation led me to move away from a more illustrative format that I began to understand the struggle of which I was a part. I became aware that many wildlife artists, Bob Bateman being perhaps the most vivid example, were far more modern painters than I had realized, and that it was their association with the term "wildlife art" more than anything else that caused them to be marginalized by the cutting edge art world. The San Francisco Chronicle art critic who described Bateman's work as "mere illustration" is only one case in point. As I began to appreciate my mentors for reasons quite apart from what had originally drawn me to their work (the subject matter), my views began the shift. Gallery owner and mentor Dennis Salvo introduced me to Ray Harris-Ching, whose wild bursts of contemporary experimentation and total refusal to be categorized gave fuel to my own explorations. A rigorous study of art history in college expanded my world view in ways for which I will always be thankful, and the insularity of the wildlife art community in general began to look less like the bullying of the bigger artists on the playground and more like what it was, a very limiting and self-imposed isolation. It wasn't long before decidedly modern elements began creeping into my work, and to my surprise, the market I was already in the process of building seemed pleased. I've often wondered how different my work (and life) would be today if those first steps out of bounds had been met with derision and empty bank accounts rather than delight and sold out shows. Certainly (and understandably) it is the necessity to make a living that is the most common and pernicious source of artistic self-editing. I recall quite vividly the skepticism with which then gallery rep Dennis Salvo looked at some of my first experiments with the non-objective, most notably my Resurrection of Flight series, five works featuring realistically painted birds wheeling through miasmic swirls of chromatic space, their flight paths prescribed by arcing lines and streaks of color. I recall him praising them as "artistically fabulous" which I already knew to be code for "Great work Andrew, but these will never sell." To his credit, however, he hung the pieces, and to my relief, they did sell. To this day I remain grateful for the success of that show and the role it played in reaffirming my path toward carving out a niche that today is both uniquely mine and, quite startlingly, as successful as it is honest. I was a marketing presenter at the Susan Kathleen Black Foundation Workshop in Wyoming in 2005 when Greg Beecham complimented the workshop participants on their technical proficiency, but noted that the work was "lacking poetry." For whatever reason, I was approached over and over again during that workshop to clarify what Greg had meant. In addition to the obvious, "You'll have to ask Greg," all I could offer was this: the difference between prose and poetry is economy. The poet uses one carefully chosen word where the novelist would use a hundred. Poetry is not deliberately abstruse; it's simply dense because what is there is saturated with meaning, rather than glazed with it. When Greg asked in his quiet and gentle way for more poetry, I believe he was asking for the same thing Simon Gudgeon is asking for, for artists to bring something of themselves to their work. Art is more than the sum of its parts, and many inexperienced or hesitant painters fill their work with noisy and unnecessary details either to mask what is essentially an unrefined vision, or worse yet, simply because it was there in the photographic reference. It's easy to see how, in a field of art so dominated by concerns about "accuracy," that photographs become dangerous masters rather than valuable allies. Unfortunately, artwork that is blithely drawn from a slew of unfiltered reference material is almost certainly destined to be prose, not poetry, and not very good prose at that. Kingswood and Gudgeon both admonish painters and sculptors not to allow the photograph to supplant one's own artistic vision. There is nothing inherently wrong with being descriptive, but art that has proven itself to be the most historically enduring has done so, not because of what it describes, but because of what it evokes. Between the drudgery of illustration and the vacuity of decoration lies the evocative; that is the province of the artist, and that is the vein that wildlife painters who wish to challenge themselves must mine. I don't want, however, in this esoteric discussion of artistic intentionality, want to gloss over the commercial realities of life as a fine artist. What if galleries and collectors don't march to the beat of our new drummer? That's always a risk, but I firmly believe that every artist is better off painting what his soul demands and then seeking out those who appreciate his vision, rather than subjugating his own impulses to perceived market requirements. I'd be lying if I claimed that I had not created plenty of "artistically fabulous" (as Dennis Salvo would say) paintings throughout my career that have never found a buyer, but overall I'm shocked and thrilled by how often I find a home for truly unique work that I painted solely for myself without any regard to its salability, and often in full knowledge of its unlikelihood to sell. Hemmingway once observed "The truth has a certain ring to it," and I wholeheartedly agree. Strictly playing the numbers, it's a pedestrian world, and we've all cringed at the sight of manufactured dreck passing as art and raking in a fortune, but true artistic expression, unfettered, naked, and unabashed, exudes the raw beauty of truth, and that is as unmistakable and alluring to the discriminating collector as it is imperative to the artist who creates it. If wildlife art is to evolve in the new century, and if it is to find a way out of this identity crisis, it must shake off the external forces of commercial and critical acceptance and look to satisfy its own needs for its own sake. Whatever our freedom costs in the short run pales in comparison to the burden of dishonesty. With a little luck, the rest will follow. The good news is that the first steps toward a brighter future for animal art have already been taken. Over ten years after my first major gallery showing, I've become quite involved in our close knit community through organizations like the Society of Animal Artists and the SKB Foundation, my participation in major shows like Birds in Art, and relationships with important institutions such as the National Museum of Wildlife Art, and I've become more and more aware of the pulse of this strange creature we call "wildlife art." In just the past few years, I'm seeing fresh and contemporary work peppering the market with increasing regularity and, in some cases, becoming quite prominent. I believe that a loose but broad movement is afoot within the wildlife art community to take on exactly the challenge that Ron Kingswood and Simon Gudgeon are making, to look beyond the photographic reference, to see beyond nature itself to something higher, something only the artist can see with his inward looking eye, and create work that has relevance beyond its subject matter. Along that vein I must clarify that I have no desire to impose on other artists the same kind of pressures and expectations I once resented. Just the opposite. If artists begin moving in a more contemporary direction because they don't want to be left behind as wildlife art evolves into the 21st Century, if they make changes to their work simply because the market shifts in a more contemporary direction, the point will be missed entirely, and we are likely to come to a place even more dissatisfying than the current malaise. It would be akin to moving to another apartment in the same building, a different room with the same tired view. The challenge I offer is only for self-identifying wildlife artists to honestly ask themselves the question, "Why am I painting what I am painting the way I am painting it?" If the answer is, "Because it pleases me," then there is no reason to change, regardless of whether or not your work is riding this contemporary wave. If, on the other hand, the question makes you uncomfortable and the answer does not come readily, at the very least it is time to honestly reevaluate your work and its direction. If enough animal painters and sculptors do that, then we can be assured that whatever identity wildlife art finds in the new millennium, it will be one that is more honest, more appealing, and ultimately more meaningful than its current incarnation. Society of Animal Artists member David N. Kitler and his work are being showcased in a feature article in the April 2011 issue of The Artist's Magazine, on newsstands now. The multiple-page spread includes several of David's latest pieces - with an emphasis on David's quest for uniqueness and originality in his work - along with a step-by-step demo on acrylics techniques. 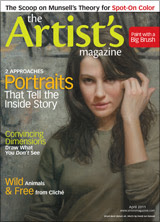 With a circulation of over 140,000 copies, The Artist’s Magazine is the world’s leading magazine for artists. It focuses on spotlighting the processes of the best artists working today, while keeping readers abreast of professional practices that can help advance their own careers. A regular contributor in the "Drawing Board" column, David has also won First Place in the magazine’s prestigious Annual Competition (Animal/Wildlife category), and was later honored to serve as its Juror.